Snakes for sale! Snakes for sale! The following snakes are available for sale right now. Before contacting me about these snakes, please read the FAQ and terms and conditions before contacting me; you might find the answer to your question that way. 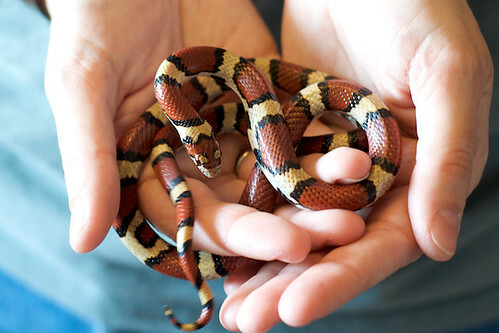 One of the smaller subspecies, Red Milk Snakes are not often seen in captivity. I acquired this one as part of what was supposed to be a breeding pair, but later turned out to be two females. (The other has found a home with a friend.) Gentle and small, this CB 2002 female is still eating fuzzy mice. Last updated: June 27, 2009.